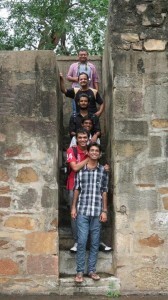 LetsNurture has regularly been organizing yearly outings or office Picnics. Last year in June 2012, LetsNurture’s team of more than 15 people including girls, had set sail by road to Udaipur and enjoyed there for 2 days before heading back to resume their corporate duties. This year, in 2013, different ideas were being discussed in office during lunch hours, to decide on appropriate locations. This time, the weight was more on going to near by places just for a day or so, which would give an enjoyable experience. Suggestions like Pavagadh, Saputara, Polo forest, Jhanjari, etc were given for many days. At last, Polo forest near Idar-Vijaynagar was decided by the management of LetsNurture. A trip to any forest is best done, in a rainy season, where there is much of greenery around and where animals and birds are seen in plenty in the forests. The Polo forest is famous for its greenery and vacation purpose. The ancient Jain temples of Polo Forest also provide a good photography opportunity for people and bask in silence of Mother Nature. It also provides natural scenery of rivers flowing down from the hilly areas. Once the trip was decided, it became a heavy task for the Human Resource executive Ms. Rupal to take the final count, as many were opting in and out of the trip making the final count difficult. If 2 people would come in, 3 people would opt out, citing personal reasons. Regular attendance and office emails were sent and done till the last day. Finally, the count on the last day before the trip came to 11 people. Earlier, Ketan Sir, our Boss of LetsNurture was mulling on taking a mini bus, if more people joined in, but he decided ultimately to take the best transport for all. A ‘Toofan’ Jeep, which would accommodate all people together, and make the trip enjoyable. A wise decision for sure! As being a rainy season, the team wanted to leave early, as the location was about 150 km away from Ahmadabad. We also wanted to avoid the morning traffic and reach early to enjoy the wonderful sight seeing along the way and click some shots before it would get crowded. So we decided to leave early at 4 30 am to reach there before 6 30 am. Some people like Ms. Rajal and Kuldip, who were staying far from office locations had pick up issues. Rajal was to join from Naroda, while Kuldip was to join from Chiloda circle near Gandhinagar. It was decided to assemble at the office point between 3 30 am to 4 am and take Rajal from there. As is known, any trip begins late when there are more then 6 people on board. The Gang of 9 people picked up Rajal and headed towards the chiloda circle to pick up Kuldip. He arrived soon after 15 minutes and joined the team. The driver was given instructions on the route of the trip. When the journey started, there was expectation to play songs on the recorder, but it was soon found out, that the jeep had no recorder to play any songs. Instead, the group started enjoying with each other, teasing everyone around. Manan and Kuldip were teased around for their photography interests and Coffee, while Rupal was teased with her H.R duties. Ultimately, she had to tell everyone that she is not an H.R executive for the day. The girls started enjoying themselves and chatting around. 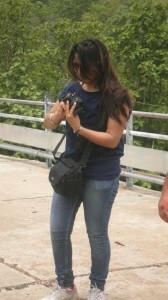 Manan concentrated on his DSLR camera, while Chirag joined the girls in chattering. Amit and Ketan bhai sat silently with the driver, occasionally joining the talks. Due to early morning, there was less traffic on the roads, which helped ‘Toofan’ to pick up good speed. It was drizzling with light rain, which added a good mood to the journey. The early morning of passing village scenes were a delight to see. We soon neared to Idar- a city in the Sabarkantha district of Gujarat. We learnt from the driver that, we were very near to the border of Rajasthan-Just about 55 km away. We were only 40 km away from Vijaynagar and the Polo forests. The place, we learnt is at the foot of Aravali mountain ranges and one of the hottest spots in summer times. Our team stopped at a petrol pump to refresh up. And we were lucky enough to come at very close range with the Idar Mountains known as ‘Idariyo Gadh’ which was just a foot away behind the petrol pump. Manan stepped out with his DSLR and tripod, while Kuldip was already clicking pics of the mountain. The Group pictures were taken, with boss’s mood opening up as the morning dawned. 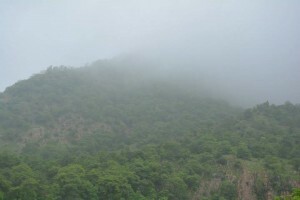 Being a rainy season, the Idariyo Gadh was at its best, with clouds and fog touching its tip. What a sight to see. The girls joined in the photo sessions with various natural pictures of their being clicked. Navdha, who was seen dozing in and off in the journey with Rajal, finally woke up and started participating more freely in talking. The 2 laurel and hardy girls-Pinal and Ankita were having a great time, telling jokes and stories of their school times. We soon resumed our journey towards our destination. 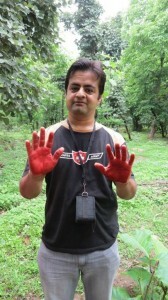 Kuldip had managed to arrange for a guide at polo forests, so he managed to contact him. The roads started getting narrow, but soon we were greeted with nature wonders of rivers flowing in with natural mountain slopes in their background. And guess what? As soon as we entered the area, everybody’s phone network went zero, as there was no phone tower in the vicinity. We remained almost with zero phone network for full 6 hours we stayed there. We soon reached our guest house. The guide was no where to be found. As we reached in early morning at 7 30 am, the place was kind of deserted except the staff and small puppies who greeted us. Kuldip and Chirag went back to search the guide, while the group started playing games. Rupal and Kaushal- Rajal’s brother played badminton for some time, before switching on to playing stationery Football game with the rest of the group. Manan had meanwhile clicked some wonderful spider web photos from up close, which came out very clearly. When the duo came back to the guest house, the guide had already arrived, and had talked with Ketan bhai about the next program at hand. 1 room was opened where the Gang rested for an hour and freshened up. Some Indoor photos were clicked as usual with jokes and laughter. It was first decided to trek the mountains, before going up the dam in afternoon after lunch. The guide ‘Dalsukh’ led us to the starting edge of the jungle, where he gave us information on the Polo forest. He warned us not to create any noise while trekking, as that would disturb the environment. Sure! All the way, we did just the opposite. We were informed that the Polo forest has about more than 480 plant and fauna types, 260 types of birds and more than 30 types of reptiles. We were told that the forest had 2 leopards and 12 bears, 12 hyenas and about 60 vultures in the mountain. We hoped to see at least a bear, but we were disappointed as we could not see any wild animal. Dalsukh explained that the ancient polo city was built near the river Harnav a small but clean river from 6 to 10th century. It was built as a symbolic gateway between Gujarat and Rajasthan. It was a lost city we saw. The forests have about 400 sq km area of mixed dry deciduous forests. 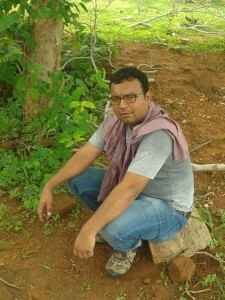 We started trekking up the hills in one line, after clicking some pictures down. A dog had started following us in the trek, which remained with us, till we came back to our rest house. The guide was giving us timely information about the plants and trees in the forests. He gave us information on orchid plant and other trees. Kuldip was in continuous conversation with him to know more, while Manan would regularly take out his camera and start clicking, while the girls stood listening and talking in their groups. Ankita, Rajal , Pinal and Rupal were at their best cracking jokes, with Rajal joining in with her one liner jokes. Kaushal, Ketan bhai and Amit looked on the happenings, while Navdha joined in occasionally with her DSLR to click pics. Chirag was busy basking in the occasional sun, which came out from the clouds. He looked most excited throughout the whole trip. As we reached a certain distance, some of the group members got tired and wanted to go down back, due to lack of trekking experience. They were assured that the tip of the mountain was not far, after which they joined in. 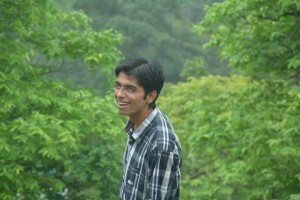 Being a rainy day, it was very humid, which made ketan bhai’s shirt sweat from top to bottom. The guide soon led us to a spot famous as the echo point. The clouds were busy settling near the mountains, which made people pose for the pics. What a wonderful sight it was. Everyone was busy in listening to their echoes, before Rupal suggested that everyone join in with one group echo. Point made and accepted! At the count of three, everyone shouted their echoes over the hills, which was well recorded in the video. As we reached the tip of the mountain, we could see some phone network coming. Urgent calls were made to families telling them about the trip and the current location. We were soon led down the hills from the other way, to the famous Jain temples of the Polo Forests. The 2 Jain temples date back to 15th century and were lying in ruins. It there was also a shiva temple nearby and a step-well that presented good shooting pics. The 2 Jain temples had beautiful carvings and sculptures. The temple structures were solid and it is still a wonder as how these ruins still stood against the time without falling down. 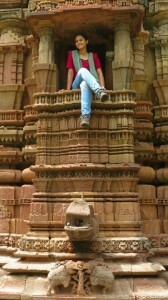 The guide told us that, the temples had built in with only mud and local materials without the use of cement or stones. Manan and Kuldip started photographing the temples and the surroundings. They were so engrossed that the group had to repeatedly call them to join them further. The girls posed in different styles, sitting on the patios of the temple. Manan clicked some wonderful close up shots, while Kuldip concentrated on pillars of the Jain temple. We came down the Harnav river which was shallow and very clean. We stayed there for a short time before heading back to the guest house. We came back at about 11 30 and were tired to the core. We also noticed other visitors coming in. We started some Nasta party as we had decided to have our lunch after visiting the Harnav Dam nearby. After some snacks, we headed towards the Dam which was about only about 2 km. The Dam is known as Harnav Dam or Vanaj Dam, located close to the Vanaj village. It serves for the purpose of irrigation as well as control flood situations. Dhansukh informed us that the catchment area of the dam is about 116 sq km and was completed in year 1990. Our group once again engaged in some photography. Kaushal and Rajal went down to the river to explore, while other girls started posing and talking among themselves. Manan and Chirag were seen in some serious talks with Ketan bhai over something. Amit went down to join Rajal. We soon returned back to our guest house to find our lunch ready. The food was simple and delicious. After lunch, everyone started feeling sleepy. Jokes soon started flowing around while discussing the next place to visit. Rajal suggested visiting Vireshwar Mahadev temple on the way back, which is famous for the water that flows from a banyan tree all the year round. Everyone agreed to visit. Meanwhile Kuldip had gone back to rest house to rest, while others rested on the chairs. It was time to go so everyone packed up and left soon after freshening up. On the way, we stopped at Vireshwar Mahadev temple, a Shiva Temple. There is a legend that sweet water flows down from a tree into a tank. The water is said to come down from the mountains. Rajal led Kuldip, Manan and Rupal to the source of the water up near the tree, while others joined in after some time. Rajal was insistent that we visit her uncle’s place on the way back for some tea and snacks. It was raining heavily, by the time we reached her uncle’s place. They received us warmly and offered us tea and snacks. As it was a Sunday, an old film was running on the TV which has been repeated around 1000 times a year. We soon left the place and proceeded on the way back to Ahmadabad. On the way, the girls started playing the Game ‘Antakshari’, at the backseat, while Amit and Ketan bhai suggested songs occasionally. Chirag, Manan and Kuldip joined in often with group singing. Soon sleep started conquering all, with Manan being the first wicket to fall. Navdha and Ankita soon followed after with Rupal falling in last. Rajal and Chirag were the only ones, who did not fall asleep and instead switched on to listening songs. Kuldip switched over to clicking pics. Rajal and her brother were the first ones to be dropped off at the chiloda circle. Kuldip was dropped off at Gandhinagar, after which the office trip came to an end at 6 pm. The next day, it was pictures sharing among office staff. A memorable trip for sure. On the whole trip, it was observed that Amit was the silent one amongst the group members, he was the ‘chhupa Rustom’ as he occasionally joined in with jokes and songs. He observed people. Rajal was at her best, with her jokes, while her brother was little shy. Manan and Chirag were in their good moods, finding out various ways to tease girls. Kuldip joined in sometimes, often seen clicking pictures. Ketan bhai, Pinal and Ankita were seen pulling legs of the rest of the group. Navdha and Rupal joined the girls sometimes, but they were more interested in seeing the scenary passing by.